At the end of our Make U summer camp we gave each camper a grab-bag with parts to get them starting making their own DIY lightsaber. Over the course of Make U we learned about circuits, LEDs, and batteries, setting you on the path to becoming a full Jedi Knight. Let’s see if you can use this new knowledge, and a bit of creativity to make your own lightsaber! Being a maker is about using your creativity to come up with original solutions to turn your ideas into reality, so giving you all the parts to make your lightsaber wouldn’t be giving you the full maker experience. You’ll need to find a few important parts to finish your lightsaber. There are two great tutorials on the website Instructables that can give you ideas for building your own lightsaber ( click here and here). To build my own lightsaber that you saw in class, I drew from both of these tutorials and used some of my own ideas. To build the blade I took two lengths of conductive wire (I used stiff zinc-plated wire from Home Depot). I then wrapped one terminal of each LED to either side of the wire. Keep in mind that the LEDs must have all of their positive terminals connected to one wire and all of their negative terminals connected to the other. If you cross terminals or wires, the LEDs won’t work. Once you’ve wired your LEDs, test them by connected the two wires to a power source. For my power source I used the same motor that we used to build our brushbots. You can buy children’s electric toothbrushes from Walmart for $7.00 for two, plus they come with AA batteries. You can use any power source you’d like. Try searching a dollar store for something that will fit in your lightsaber handle. If you want to go a more professional route, you can buy power sources from places like Radio Shack or the Source that would work as well. To connect the wires to the toothbrush power source, I used a soldering iron and some lead-free solder. It would probably be best if an adult helped with this since soldering irons get quite hot. If you don’t feel comfortable with soldering, you can use black electrical tape or marrets. 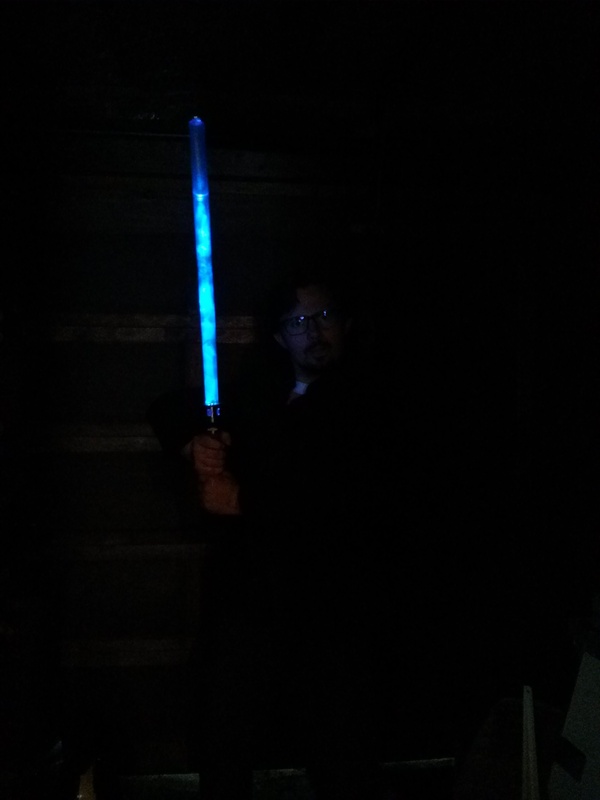 Once everything was powered I put it all inside of my handle and the LED blade stuck out of the front of the saber. If you want the blade to look more uniform, try sanding the plastic tube to give it a more translucent look. I also wrapped my LED blade with tissue paper to help diffuse the light. While this project might take a bit of trial and error, I encourage everyone to give it a try. Look for similar projects on the internet and see which steps would work the best for you. 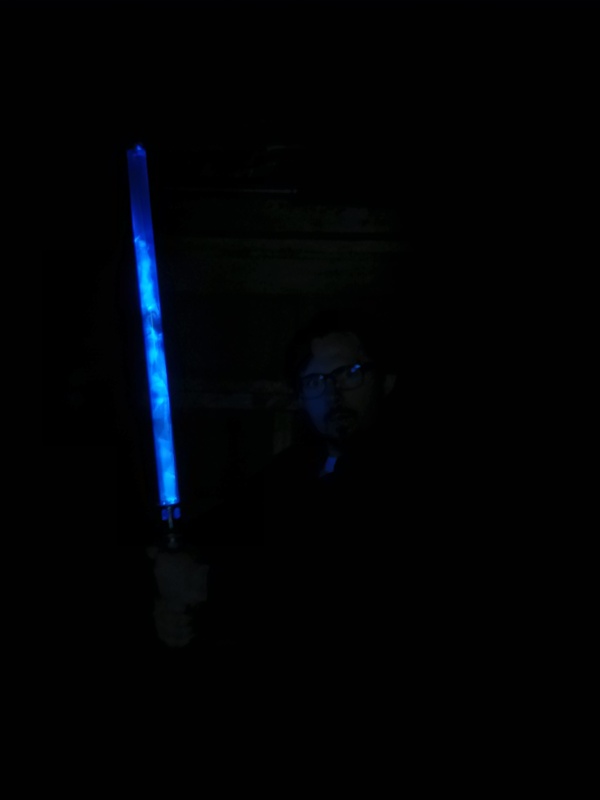 Once you’ve finished your lightsaber, we’d love to see your pictures of the final projects. If you have any tips or questions, please don’t hesitate to contact us. Thanks to everyone for making our camp awesome! And may the Force be with you. EDIT: After writing this post we discover a fantastic infographic by a company called Newark describing how to make a DIY lightsaber. It’s definitely worth a read.